If you want to bring your bikes for your family getaway, you might be in the market for a reliable safe bike rack for your trailer. There are a number of things to consider, so, in this article, we are going to give you as much information as possible to make your purchase easier. Let’s get started. There are multiple types of racks available today for a travel trailer. However, before we explore those, there are some questions we need to answer. If you would like to read a detailed review of Hollywood HR135 Tow’N Go travel trailer bike rack click here. What size trailer do you own? Travel trailer usually come in three sizes, small (less than 18 feet), mid-range (18 to 25 feet) and large (25 to 40 feet). Depending on the size of the trailer you own, you have to consider additional weight and size of the bike rack you will be using. You have to make sure you do not exceed the legal weight capacity or the size restrictions with your new bike rack with the bikes on it. 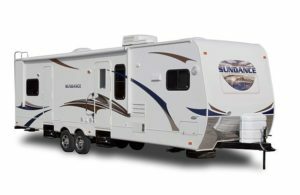 Here is a good article on general RV regulations by state. How many bikes will you be using the bike rack for? Most people spend too much money for a bigger bike rack assuming that they might need the extra space it provides. Try to be practical. For example, if you have two adult bikes and a couple of small children bikes, you may not need a 4 bike rack. If the children bikes are small enough you may be able to secure them inside the trailer and just get a 2 bike rack for the adult bikes. 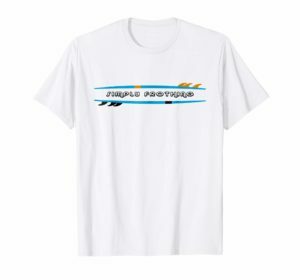 Do you have a recumbent or tandem bike? Irregularly shaped bikes will not fit on every bike rack. Are you going to need to unload and load the bikes constantly? If you are going to do this, you may want to consider a rack that is easy to adjust, that can fold. The folding feature is also important if the bike rack may be in a spot that can block easy access to the travel trailer’s doors. The rack may have to be custom fitted. 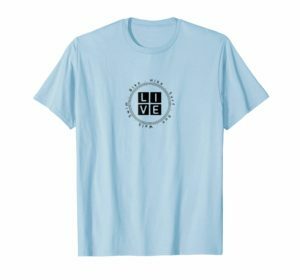 Does the rack include a protective padding? Some racks do not include enough or no padding and might end up damaging the trailer. Is the rack easy to assemble? Some bike racks can be challenging to assemble or may require at least two people. Keeping these questions in mind, let’s look at the available options. Also known as a ‘trailer-tongue mount’, this bike rack is either welded or bolted onto your trailers’ tongue frame. It is mounted over the top of the propane tank via a carrier. It usually carries up to 2 bikes, and its weight can go up to 150 lbs. Because it is in front of the trailer, and it sits high above the tank, the bikes are easily visible thru the rear view mirror. They tend to be pretty solid, however, it can be hard for one person to hoist up and secure it. You may need to have it professionally installed. The last thing you want is a bike rack that is unstable sitting above the propane tank. 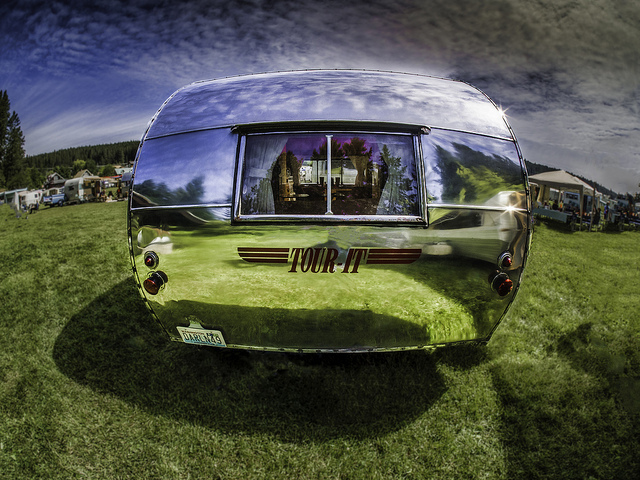 Here is a detailed general article about RV propane tank safety. Depending on the model, some of them can be installed with a bar that lets the rack pivot on the drawbar. It is great if you are planning a long trip. 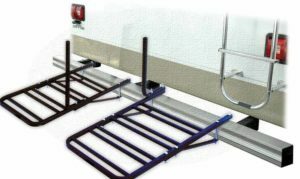 Stromberg Carlson (CC-275 Bike Bunk for Cargo Tray) is a solution most people use for an over the propane tank bike rack. This is an adjustable frame you install over the propane tank that is designed for a bike rack that fits a 2 inch receiver. Even though most reviews are positive for this solution, it really matters what kind of vehicle you have. My advice is to read the customer reviews for this before making a decision. 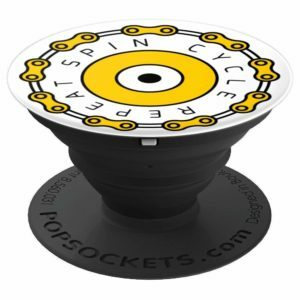 It supports up to 100 pounds, and can be mounted on a A-frame at widths varying from 14 inch to 55 inch. A hitch mounted bike rack sits parallel to your trailer just like a trunk mounted car rack does. The difference is it requires a hitch or a receiver. It can carry up to 5 racks. Usually, this type of rack is also used for trucks and larger SUVS. It is easy the load and unload the bikes and gives you the flexibility to fit a verity of bike frames. Generally, you do not have to remove the front wheel of your bikes when you mount them on the bike rack. Depending on the size of the rack you are using, this type of rack is easy to install. The parallel positioning of the rack makes it less likely to scratch the trailer. You also may want to consider a rack with well-spaced cradles that are made of padded materials in order to avoid your bikes from getting scratched. Some models allow the arms of the bike rack to be folded when you are not using it. If you want to secure your rack, you can use a locking hitch pin with this type of rack. 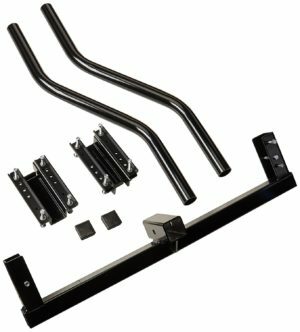 If your travel trailer does not come with a hitch receiver, you will have to buy and install one. Because the rack is installed to the back of the trailer, it will be hard to see them thru the rear view mirror and this will make maneuvering a little more challenging. Usually, hitch mounted bike racks are not tandem friendly. Not using your travel trailer this weekend but still need a strong reliable 4 bike rack for your truck? Read our Hollywood 4 bike racks review. If you only have a couple of bikes that are not too heavy, a ladder mounted bike rack can be an inexpensive solution for you. 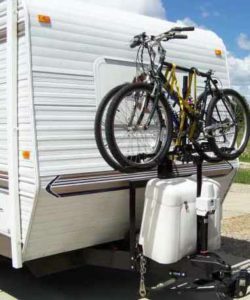 Average RV ladders can usually handle up to 250 pounds which should be good enough for the rack and two bikes. However, just to be safe, please check the weight limits of the ladder you wish to mount the bike rack to. Also, extra straps might need to secure the rack and the bikes to avoid any damage to the ladder or the trailer. Some ladder mounted racks feature a pivoting arm to allow easy access to the ladder itself. 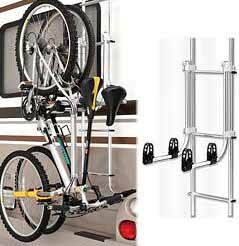 A bumper mounted bike rack is a bike carrier that is affixed to the rear bumper of a travel trailer or and RV. It requires a bumper mount receiver or a bolt-on receiver to secure the carrier. They can be flimsy, please make sure the bumper that it is mounted on is strong and welded safely. The bumpers are not designed to carry heavy loads, so you may have to reinforce it with extra welding. You may need professional installation for all these. A bolt-on receiver is more secure because it is bolted to the actual frame of the trailer rather than the bumper itself. Also, the width of the receiver is adjustable, which is convenient for different frame widths. Depending on the model, it can carry up to 4 bikes. A bumper mounted bike rack will add length to the trailer and is not visible from the rear view mirror. 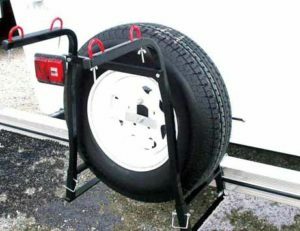 This type of rack is affixed to the spare tire mount of the trailer. It cannot carry more than 2 bikes because of weight restrictions and most likely will require extra support for safety. The bikes may block the rear brakes lights and or license plate. On the other hand, they are usually inexpensive and if you purchase one with carrying arms, you can collapse them when you are not using the rack. Finally, last but not least, roof mounted bike racks can give you a viable option. They are usually made of light metal and can carry up to 4 bikes. They are a good option for oddly shaped bikes, on the other hand, depending on the model, you may have to install a crossbar system on the roof. A roof mounted bike rack will increase the weight and the height of your trailer, so make sure to check the limitations on those. Also, if you are planning a long trip, the weather might be something you may want to consider, especially the wind. If they are not factory installed on your trailer, professional installation may be required. As you can see, there are a number of options to consider for a reliable bike rack solution for your travel trailer. We tried to give you as much information as possible so that you can choose the best one for you without spending a ton of money. Hopefully, we were successful in achieving that goal. Safe travels! If you think you might need extra roof top cargo space for your trip, you might find our Thule 682 cargo box review helpful.